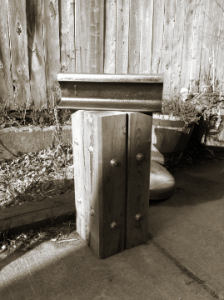 No sooner had I built my ‘stump’ out of 6″x6″ posts, than my wife says to me “You know, now that you have an anvil stand, you’re going to see free tree stumps all over the place“. This is about 300 lbs of hard maple. I was doing some renovations over at my sister-in-law’s house, and the neighbour was having a tree removed. I took a walk over to talk to the guys when they appeared to be on a break (I hate interrupting people while they’re working) and 10 minutes later, I had this. The photo doesn’t do this stump justice – it’s massive. I could barely push it up the slight grade of the driveway, and it bent the axle on my dolly. It’s actually a bit too big for my little anvil, but I’m sure I can put it to good use. Until I had to do it, I never would have guessed how hard it would be to find a tree stump! I asked friends and family (in person and via facebook) to let me know if they had ideas on where to find one. I called around to wood lots and tree trimming companies, none of which were helpful. 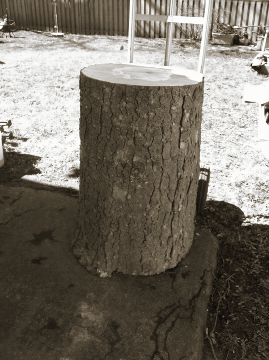 Even after a major wind storm, when there were trees down all over the place, I couldn’t find anyone with an anvil-stand sized stump. But after my first few forging sessions, using the steel work table under my crane rail, it was obvious that I needed something. And so, I made one myself out of 6″x6″ pressure treated posts. And I can tell you, it is a vast improvement! 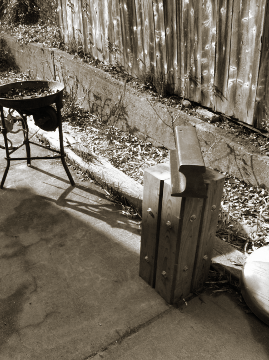 The rail feels like a proper anvil, now that it’s on something solid. I’ve got it set a bit higher than the ‘knuckle’ height that’s recommended for an anvil – but I’m doing light work, and find it more comfortable.